Cookie Dough is a wonderfully potent Girl Scout Cookies phenotype. This particular version of the West Coast’s most popular strain exhibits an orange/yellowish sheen of trichomes and a pungent doughy aroma. Cookie Dough’s effects align closely with GSC’s, offering medical-grade sedation on the body and a well-lit mind that borders on speedy. 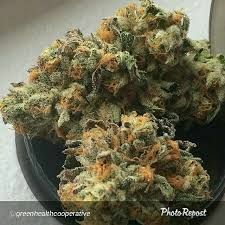 Enjoy this strain as a means to stimulate appetite and dull physical pain while remaining mentally alert. Beginners beware, as this potent phenotype can be overwhelming. Negative effects such as mild dizziness and dry eyes have been noted by some consumers.